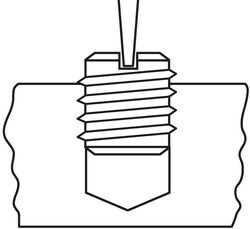 Unlike E-Z Coil™ inserts, which require a special tap and installation tool, E-Z LOK™ (Solid Wall) threaded inserts for metal are installed using standard tools. Simply drill the appropriately sized hole with a standard drill, tap the hole with a standard tap, and then turn in the E-Z LOK™ like an ordinary fastener with a screwdriver, bolt and jam nut, or an E-Z LOK™ drive tool. Installation is as easy as 1-2-3. 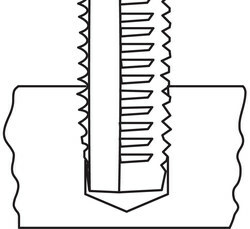 E-Z LOK™ inserts are self-locking. Immediately upon installation, pre-applied LOCTITE™ on the external threads begins to set and the newly installed insert is fastener ready in minutes. At full cure (72 hours), the LOCTITE™ seals against liquids and gases to pressures of 6,000 psi. 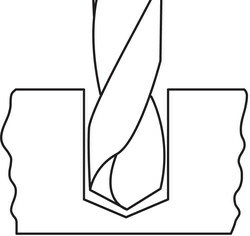 Drill hole with standard drill. Tap hole with standard tap. Power drive tools are available for high volume installation. See insert tables for catalog numbers and sizes.